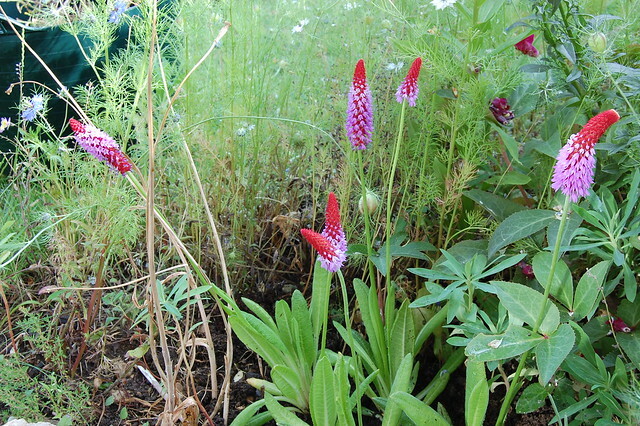 Primula vialli, also known as the orchid primula or red-hot poker primula, is a small but dramatic plant. And, yes, that’s what it looks like planted in our garden. We couldn’t resist the lure of adding to our collection and, if it survives (hardy down to -10°C but the soil might be drier than ideal and primulas can be attractive to slugs), it will be an excellent colour boost to the garden when it re-emerges in late spring next year, helping deal with the limited range of colours I noticed in my last post about looking down from above (Garden Constellations).